Jake Gyllenhaal starts to freak out over an iconic Vigo the Carpathian painting in the hilarious Ghostbusters 2 and Velvet Buzzsaw mashup. It's been a pretty big week for Ghostbusters fans with the announcement that Jason Reitman is making a new movie for the franchise. It's still way too early to tell what the movie will be about and who will star in it, but it has fans hyped for the 2020 release date nonetheless. Now, we have been treated to one of the better mashups in recent memory. The Ghostbusters 2 and Velvet Buzzsaw mashup video begins with Jake Gyllenhaal's Morf Vandewalt character freaking out, like he does in the horror movie trailer, but this time it's over the Vigo the Carpathian painting from the iconic Ghostbusters sequel. The results are pretty funny and they match up really well, leading one to believe that Gyllenhaal's upcoming horror movie will have some striking similarities to the original Ghostbusters sequel, which isn't necessarily a bad thing. They both have some pretty evil artwork. Velvet Buzzsaw hits Netflix and select theaters on January 27th and stars Jake Gyllenhaal and Rene Russo. The premise is a lot different than Ghostbusters 2, but there are still some similarities. The story centers on some recently discovered art by a mysterious and unknown artist. From there, a supernatural force takes revenge on those in the art community who have allowed greed to get in the way of their art. Netflix has been doing really well with the horror genre, especially with the recently released Bird Box, which has caused a national phenomenon. Ghostbusters 2 features Egon Spengler, Ray Stantz, Peter Venkman, and Winston Zeddemore after some hard times. Things take a turn for the weird when Dana Barrett's boss at the Manhattan Museum of Art is taken over by the spirit of Vigo the Carpathian, a powerful legendary sixteenth-century tyrant and magician who just so happens to be trapped in a painting in the gallery. While not as good as the original Ghostbusters, the sequel was still a big hit and it was the last that we would see of the original cast for quite some time. As for what Jason Reitman is cooking up for his take on the Ghostbusters franchise, that is not clear at the moment. The movie has yet to be cast, but many are hoping that it will feature Bill Murray, Dan Aykroyd, and Ernie Hudson from the original cast. Sadly, Harold Ramis passed away in 2014. Reitman is set to direct and co-write the upcoming movie, which he stresses will not be a reboot. Instead, the director/writer says that his movie will be the next chapter in the franchise, meaning that it's possible that some of the original characters could have cameos when the time comes. 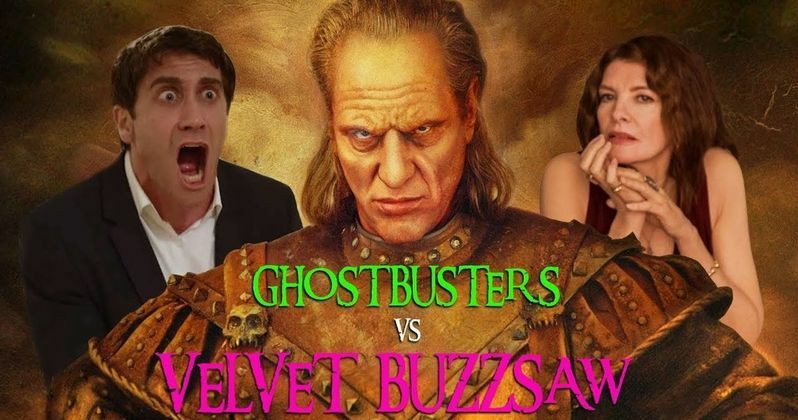 While we wait for more news, you can check out the Ghostbusters II and Velvet Buzzsaw mashup below. This comes from Funny or Die.